Considering how much I paid for my iPhone 7, I sometime think I should keep it in metal box. Since that’s not practical, I’m always looking for a case that can provide maximum protection. Lately, my phone has been comfortably enclosed in the latest shockproof case from Yesgo . The case is made with a plastic material that is both flexible enough to wrap around the phone but also stiff enough to give it a solid feel. 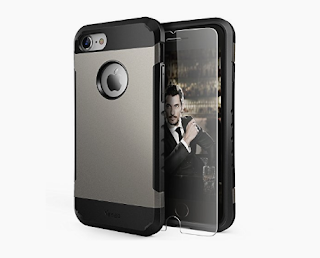 It adds another layer of protection with a metallic panel that snaps into place on the back side of the case. The result is a phone that feels good in your hand while maintaining the light and nimble quality of the phone itself. I had no trouble slipping my phone into the case and the raised power and volume buttons worked perfectly. The edges of the case wrapped around the corners of the phone and Test kit comes with a tempered glass screen guard that is specifically designed for the rounded edges of the iPhone 7. The case delivered just what I was looking for - a safe and secure home for my precious device. The Yesgo case sells for under $20 with free shipping on Amazon. The sample Yes sent me had a gray gunmetal panel but you can also get one with a rose finish.